Every new mom needs to see this post! I remember when I was a new mom - the sleepless nights, the expensive diapers, wipes and formula and the constant doctors visits. Babys are an absolute joy but also draining on your wallet! We rounded up a big list of free baby samples and deals you can score to make it all a little easier. NEW Baby Box co - Free Baby Box co Baby box when you participate on their site. NEW Kolcraft Community - Apply now to test Kolcraft baby products. NEW Nosh Sampling - take a survey and if you qualify you can Sample Nosh baby products. NEW Aveeno Class Action - Submit a claim to get cash for your Aveeno Products that you've purchase. NEW Tomy Baby - Apply to test Tomy products on viewpoints. NEW Comotomo Baby Bottle - Green or Pink ONLY $17.99 - clip a $6 off coupon to score this deal. NEW $2 off Johnon's Coupon - Rare print now before it's gone. Buy Buy Baby - Free Goody Bag when you sign up! redeem at buybuy BABY Stores. Enfamil Family Beginnings - $400 in Baby Freebies from Enfamil including formula checks, formula samples and more. Enfamil Enspire Infant Formula - Get a free sample pack of Enfamil Enspire Infant Formula! Amazon Baby Box - Free full size and travel size. Includes wipes, baby wrap, onesies, diapers, and bath products worth $35. 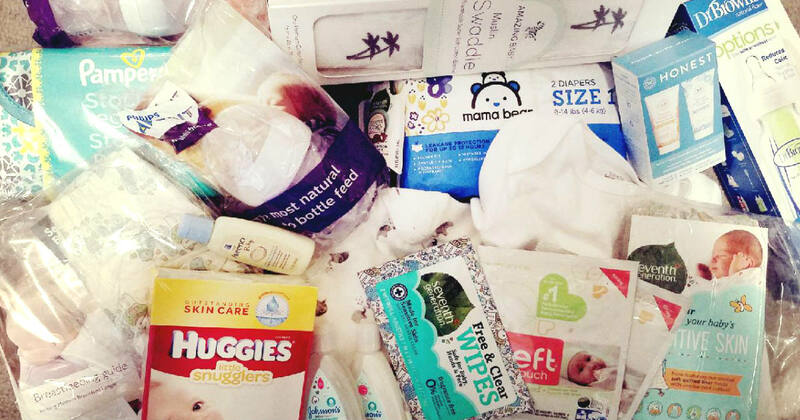 Walmart Baby Box- Free Walmart Welcome Baby Box when you sign up filled with samples. Super Mom Private Club - Get free items on a monthly basis with Super Mom Private Club! Moby Baby Wrap - Free Petunia or Moby Wrap, sign up for your chance with viewpoints. EverydayFamily - Join the sampling club for email newsletters, offers and weekly coupon alerts as well as access to free baby samples, baby coupons, baby magazines and more. Ergobaby Gift Card - Free $30 to use on baby carries, strollers and more! Target Baby Registry Kit- Free Welcome Kit In-Stores, $100 worth of free samples, diapers and more. Enfagrow Toddler Formula - Free Sample of Enfagrow PREMIUM Toddler Next Step. Enfamil Formula - Apply for free Enfamil formula from Viewpoints. MTA Baby on Board - Free Baby on Board or Please Offer Me a Seat Buttons. Born Free - Possible Free Born Free Baby Carrier. Baby Box University - Free Baby Box from Baby Box University. Similac Strong Moms - $400 in goodies including formula and a diaper bag. Forehead & Ear Digital Baby Thermometer - Pay ONLY $26.70 (Reg $90) on Amazon, this is a MUST have. Baby Shark Song Cubes - This super popular toy is ONLY $7.99 at Amazon. Gymboree Classes - Free Class at Gymboree when you sign up. Dolly Parton Imagination Library - Free Books with FREE Delivery every month until your child is 4 years old. 20% off with Amazon Family - When you subscribe to at least five baby products through Amazon Family and Subscribe & Save, you’ll automatically receive 20% off. Baby Toys & Teethers - All under $5 on Amazon - hurry!